Enabling pupils to excel and realise their full potential is at the heart of everything we do at Sacks Morasha. Interactive, exciting and multi-sensory lessons are taught throughout the school and learning is individualised according to every child’s needs. 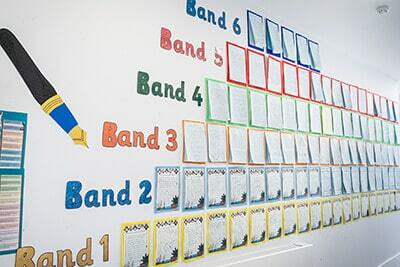 All lessons are differentiated for the children’s varying abilities and interventions take place on a daily basis, enabling children to progress at a steady rate. Our teachers plan lessons to ensure that every ability is catered for, so that all children make progress and achieve their full potential. We are constantly innovating, with a special focus on integrating Chol (secular) and Kodesh (Jewish) education. We have developed a carefully designed intervention programme so that all our children’s needs are catered for, both inside and outside the classroom, and not just in core subjects but in their emotional and social lives too. We have built relationships with leading schools around the world to share best practice, learning resources and curricula. We encourage our children to develop skills in both Chol and Kodesh studies that will make them effective and reflective life-long learners. While our school day ostensibly consists of approximately 65% Chol (secular) studies and 35% Limmudei Kodesh (Jewish education), many lessons are based on an integrated curriculum. This enhances the level of Chol and Kodesh teaching that we are able to offer, as well as making best use of the time we have available and ensuring that children have an understanding of the links between the two. Ivrit, the living language of the Jewish people, is taught as a modern language in a dynamic and interactive way. It is our hope that our children will learn and use Ivrit not only to communicate and access texts, but also to enhance and explore their Jewish identity. Learning styles are often spoken of at Sacks Morasha. We believe every child should be taught with ample opportunities to learn in a way that best suits them. All our lessons are taught using visual, auditory, kinaesthetic and tactile approaches. To help your son or daughter at home, please contact your class teacher so they can support you in explaining which style best suits your child.